Last night I was gripped by a food memory that I hadn’t had since I was an angst-ridden teenager. I thought I wanted macaroni and cheese for dinner, and while I was going through the list of what I needed to buy, I suddenly recalled a recipe that my mum had made at my 18th birthday party way back in the early 90’s. 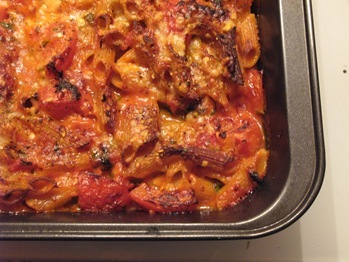 It was inspired by a Joanna Lumley ad for Sainsbury’s where she coaxed the viewers, in her posh velvety tones, through making a pomodoro pasta bake with mozzarella, parmesan and tomatoes. One sighting of this ad and I was hooked! The sight of Joanna Lumley tearing fresh basil leaves up with her glossy lacquered fingernails was mesmerising – in the late 90’s I don’t think I had even seen fresh basil outside of a jar of pesto sauce. The mozzarella I was used to was the rubbery grated stuff on top of pizzas, and parmesan came as a dried powder in a tub smelling of sick. Joanna talked through the process of adding chunks of fresh mozzarella and grated parmesan to a tomato sauce, then adding fresh basil to it and mixing with penne (penne? How exotic!) then baking in the oven, topped with more fresh parmesan. By the end of the advert, I think most of the UK was drooling. Sales of those ingredients must have soared. Everyone arrived with bottles of cheap booze in carrier bags, which my Mum, horrified, promptly confiscated. We were allowed exactly 1 bottle of Martini Rosso on the table, shared between about 15 of us. Luckily, I managed to ‘release’ the rest of the booze from its prison and we hid it under the table, furtively topping up our glasses. It was a hilarious night. But my most abiding memory was this amazing pasta dish, courtesy of Joanna Lumley, Sainsbury’s and those trusty recipe cards given out at the checkouts – does anybody out there still have this one in an old ringbinder somewhere? Here’s the recipe, which is entirely cooked from memory, so it won’t be accurate. Not bad recall, though, after such a massive gap of years – it tastes just how I remember it! 300g penne shaped pasta, cooked until just underdone. 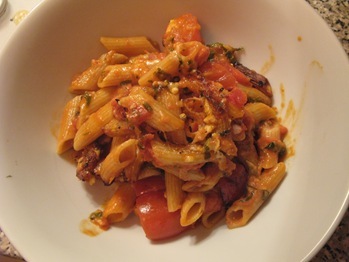 I like wholewheat penne – it has a nice flavour. Preheat your oven to 180C. Oil a large baking tray. 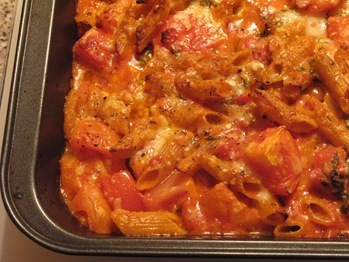 Put the chunks of fresh tomatoes in the tray and whack in the oven while you sort out the sauce and pasta. Then make your sauce. Gently heat the crushed garlic over a medium heat in some olive oil. 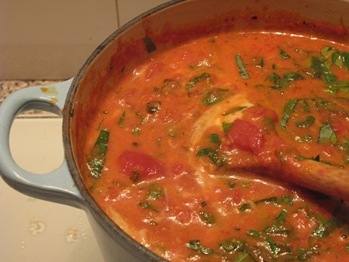 Add the chopped rosemary, then when everything is fragrant (but don’t burn) add the tinned tomatoes. Chop them up over the back of a wooden spoon if they’re whole ones. 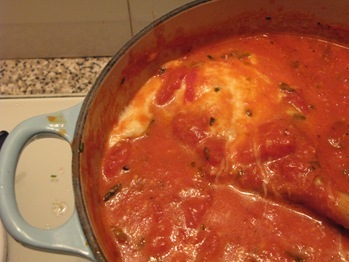 Add the tomato puree and oregano and simmer for about 15 minutes. Then add 100g grated Parmesan and all the chopped mozzarella. Let it melt slowly in, simmer for about 5 minutes, then season to taste with salt and pepper and add the chopped basil right at the end. Remove from the heat and set aside. Phwoar – tomato-ey cheesy goodness! While you make the sauce you can get the pasta on the go. Don’t cook it through completely – it has to be a little bit hard as it’ll cook more in the oven. 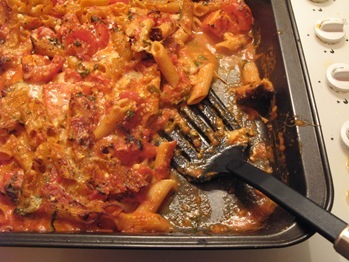 When your pasta and sauce are ready, take the tray of tomatoes out of the oven. Mix everything together in the tray, then top everything with the remaining 70g of grated Parmesan. Bake until the top is crusty and golden – about 20 minutes. It’s intensely savoury, cheesy and herby with a lovely rich taste of tomato. Great for a big carbo blow-out! Does anyone else remember the Joanna Lumley Sainsbury’s ad? I remember it too. Have been looking on the internet but can't find the original recipe. How can this be? Surely this is the kind of thing the internet was invented for?!? Good to see you back BTW – I had been having withdrawal symptoms! Love your story about the birthday party! I remember asking Mum to make spaghetti bolognese for my 13th birthday party (I think). bake. Now I’ve lost the receipe and I’m sure that something is missing when I cook it. Sainsburys little twists can you help?